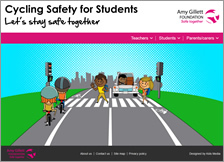 The Amy Gillett Foundation is a national organisation with a mission to reduce the incidence of serious injury and death of cyclists in Australia. They work with all levels of government, road authorities, corporate, motoring, cycling and community safety organisations and the public to realise this goal. Following is the Amy Gillett Foundation education material posted on FTfs. A cycling safety program designed to teach students about caring for their bikes and how to stay safe while riding. Facts for students, cross-curricular lesson ideas, activity sheets and extra resources including websites with further resources.